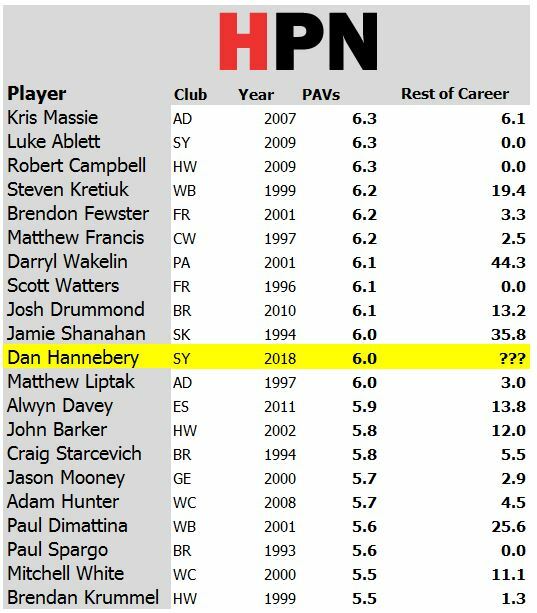 Dan Hannebery used to be a really good player. Fairly recently, too. In 2016, his third All-Australian year, he rated via Player Approximate Value (PAV) as a top 25 player in the league. At his best, he’s a hard-running midfielder who gets in good outside positions by burning his opponent, while also being able to play inside and win plenty of contested ball. Since then, to put it mildly, Hannebery’s form has declined. Through a mixture of injury issues such as reportedly playing through osteitis pubis, his output was a lot lower than AA-level in 2017. Then it got even worse in 2018 where his per-game value (measured by mPAV) to the Swans was just 30th at the club, behind players like Gary Rohan, Dean Towers and Jordan Dawson. He was comfortably below replacement level in 2018. As a 27 year old (he turns 28 in February), with some poor seasons under his belt, there is a strong chance that he will simply never recapture anything like his former peak form, and his projections don’t look great as a result. It’s unsurprising that with this recent record, Hannebery should be keen on a long term deal. He told reporters “the carrot of an extra two years played a major factor”, with the offer reportedly four years plus a triggered option for a 5th, above the current three years he had left at the Swans. As it stands, the future second pick looks the most valuable piece in the swap. If St Kilda finish 16th again, that’s pick 21, and even if they climb it’ll remain a valuable pick. Sydney downgrade pick 28, but they had a heap of picks in this range from brokering the McGovern deal and just need to be able to match for a high Nick Blakey bid. Looking at previous players to average around 6 PAV in their age-27 season, there’s some reason to believe that the 44 PAVs projection may be on the optimistic side. It is also worth noting that Hannebery consistently averaged between 13 and 14.5 PAVs in the middle parts of his career – aside from his first two years, his AA years and this year. It is fair to think that this would be the best case that St Kilda would be hoping for – not a return to his peak, but a multi-year period of him playing a useful but more minor onfield role. The Saints have managed to minimise their exposure in this deal, and have taken a small to medium size bet on Hannebery’s future. If the new surrounds get Hannebery playing productive footy for a few years, they’ll have done well even if he never stars again. The Swans get back some decent draft currency, preserve their Blakey-matching position, and shed a long term contract for a player who’s stopped being worth it. Verdict: Fair trade, especially on Hannebery’s 5-year projection.